Join HYP for a 3.5 mile loop hike in the Scratchgravels. Elevation gain is minimal, and we'll be walking at a pace commensurate with admiring and identifying any wildflowers we see. If you have a wildflower identification book or app, bring it! If you don't have anything, we'll have a few extras. Remember to bring water, too. Please indicate your desire to join us on the Wildflower Walk at least 24 hours in advance. Helena Young Professionals is partnering with Man Therapy for an evening of climbing at Stonetree Climbing Center, on March 21st from 7:00-8:30pm. Man Therapy is a Lewis and Clark County initiative that provides social outlets and de-stressing events to help people connect with one another and enjoy the Helena area. This climbing event will be free to anyone that signs up with Helena Young Professionals! This month we're meeting at Lattes and Sundaes! Sign up to take part in a citywide food drive to feed Helena's children with Helena Food Share on March 6th. Volunteers are needed to collect donations from grocery stores and deliver them to the food pantry (1616 Lewis Street). Volunteers will be sent to one of seven different grocery stores between the hours of 4pm and 6pm and are asked to arrive a few minutes early to talk with the Americorps members and get quick instructions. The Helena Food Share will already have all of the necessary materials on site. After finishing up around 6pm, volunteers will load up the crates of donated food into their car and drive it to the Food Share. Tis the season for some winter fun! Join Helena Young Professionals (HYP) Saturday, February 2, 2019 starting at 10:30 am for a snowshoe outing. Don't own snowshoes? That's fine! The first 10 HYP members to RSVP will receive a FREE snowshoe rental from The Base Camp in Downtown Helena! We will pick up the shoes and bring them to the trail head for you. Please RSVP by Thursday, January 31st. We will leave at 10:30 from the RV Ranch Area near MacDonald Pass. To get to the parking area, drive east out of town on highway 12 toward Missoula. Continue PAST the MacDonald Pass Recreation Area. After approximately one more mile, there will be an unlabeled pull out to your right. If you pass a sign that says "water 1/4 mile" you've just passed by the pull out. It takes approximately 20 minutes to get to the pullout from Helena. If you would like to caravan with us, we will meet at the Broadwater Hot Springs parking lot and head out promptly at 10:10 am. Ever wonder why there aren't more young people in the Montana Legislature? Do you ever think about running for office but don't know where to start? Join us for an engaging discussion with current young legislators. The purpose of this event is to facilitate connections and conversation so you have a better understanding of the political process, in particular, how to run for office. With moderated discussion and small group break-out sessions (speed dates, if we can call them that), you will get plenty of access to hear from the young people currently serving our state. At 8 pm the evening will wrap up with an informal mingle at the Brewhouse across the street. 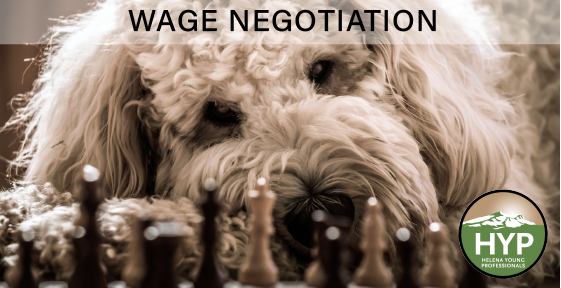 Join Members of the Equal Pay for Equal Work Task Force for a wage negotiation training. You will learn why, when, and how to increase your earnings. This interactive presentation will give you the actual skills and strategies you need to increase your pay in 2019. This month we're meeting at Chef Mai's Noodle House! Join HYP for our annual winter party, the Snow Day Social. This is the event when we say THANK YOU to everyone who has supported HYP through the years and ask you to elect your next executive board, renew your membership, and pick up your 2019 HYP member benefits card! HYP members, friends, and potential members can enjoy beer and pizza, hear from the 2018 board, and meet and vote for your 2019 leadership! Tuesdays at Murry's feature Indian specials! Nothing like curry to warm you up on a cold December day. HYP's networking lunches are a chance to break away from your desk for a casual lunch with friends. Come meet up with friends or sit with someone you don't know. There's no structure or expectation, just lunch. No need to be a member to attend! Ready for change? Don't wait! The time passes regardless, so let's make sure time is working for you. Join us at to discover—or rediscover, the joy in work. Register to reserve your seat! The event is free but space is limited. Join your fellow HYPsters for a glimpse of Helena's haunted history! Ellen Baumler, author and historian of several books on Helena's haunted past, will guide us in a private tour around town on the Last Chance Trolley Train. Meet up for a happy hour beforehand at the Windbag Saloon to walk together as a group to the pick-up location. Limited spots available! HYP Happy Hours are your once-a-month chance to catch up with fellow young professionals and wind down after the workday. Come meet up with friends and make some new connections! CHANGE OF PLAN DUE TO WEATHER! Due to cooler temperatures, potential smoke, and headwinds, the float has been changed to a paddle on Park Lake! We will carpool/caravan from the 11th Ave/Park Ave Albertson's parking lot at 12:15pm. Otherwise, we will meet up near the day use site at Park Lake around 1:00 pm to collect everyone in one spot before finding a hang out place. Please let us know if you plan to come so we can make sure we don't miss you. Picnic lunch on the Capitol lawn! Bring your own lunch or grab delicious Southeast Asian dish from one of Helena's best food trucks, Saigon Alley. We will be sitting under a tree nearby the food truck (they are usually parked on the South side of the building). Don't miss our yearly HYP BBQ! Feel free to bring friends that are not yet a part of HYP as well as your family. Kids are encouraged! All types of fun will be happening with yard games, the lake, a keg, as well as lunch! Please bring any yard games, kayaks, or any other festive fun for the day! Meet us next to the carousel to grab a lunch of your choice from a food truck or bring a sack lunch. The music we will be enjoying will be brought to us by Leigh Guest (Country / Alternative). If you couldn't make it to our last happy hour, check out another new brewery! Thousands of chemicals have been introduced into our daily environment over the last several decades. Some of the most harmful – that pose the greatest risk to our health – are those chemicals used in our own homes. Becoming aware of potentially harmful substances and clearing them out of your home can help keep you and your family healthy. Join us to learn how to have the healthiest home possible, which results in a healthier you! You are welcome to participate in our FREE make & take soft scrub activity to kick start your healthy home experience. If you haven't had the pleasure of checking out Snow Hop Brewery yet, this is the perfect time to taste their brewskies while enjoying great company. Join us at Karmadillos to network or learn more about HYP. Come join the fun and if you are a member, your first beer is on us. We will meet on the corner where the Pioneer Cabin sits at 5:30. Join HYP for a casual networking happy hour at the Overland Express this Thursday. The Overland is a great place for happy hour specials, good prices, apps, and a great patio space. Adulting... what a journey! Our Adulting 101 series of classes will cover an array of topics. No preregister is needed; you can choose which topics to pop in and out of according to what applies to your life. If you have specific topics you would like to learn about, send the topic ideas my way! Finding the perfect home should be the final step in the home finding process. We are bringing in an expert loan officer, Lisa Tinker, to speak on the process while providing you tips to make your process go smoothly. Meet us in the Power room at Lewis and Clark Brewery.